No one ever wants to be involved in a car accident. But what can even be worse, is to be the victim of a truck-car accident. Just imagine -- a typical tractor trailer or "big rig" can weigh at least 80,000 pounds. Compare that to the average automobile that weighs about 3,000 pounds (not that 3,000 lbs. is exactly "light."). Now imagine both vehicles colliding on, say, the Mass. Pike or Route 128, Route 95 or Route 495. The sound is deafening. And the results can include brain injuries, spinal cord injuries, amputations, head injuries, massive trauma and of course, death. It isn't pretty. Most people would be surprised to learn of the number of truck-car accidents that take place in this country: Over 100,000 per year. Actually, this should be no surprise, given the high number of heavy-rig trucks roaring across almost every major highway in America. These trucks don't function the same way everyday cars do: Due to their sheer tonnage, they can't stop very quickly, and due to their sheer size, they can't turn easily and have large blind spots behind them. Add it all up, mix them in with much smaller cars that make up 95 % of the vehicles on the highways, and it can be a disaster waiting to happen. Here's another fact you might not know. Some trucks must carry commercial liability insurance policies, usually issued in higher amounts than regular trucks. Typically, trucks that are involved in interstate commerce carry a minimum of $750,000 in liability insurance -- or even more if the truck contains hazardous materials. In addition, semi-truck drivers are required to meet higher safety standards than the average driver. Furthermore, since trucks are involved in interstate commerce, they are subject to the types of federal regulations that do not apply to other vehicles. Many of these are overseen by federal agencies like the Interstate Commerce Commission, and the tangled web of federal and state regulations that govern the trucking industry creates enormous legal complexity. Catastrophic injury litigation of this type can be very complicated, which is why you need an experienced Massachusetts car-truck accident attorney on your side. From our many years of experience with Massachusetts motor vehicle accidents, we know that trucks and their commercial liability insurance companies are typically far more aggressive than the insurance companies that insure private passenger vehicles (the personal cars we all drive.) It's not uncommon that when an accident victim is still in the hospital recovering from injuries, the trucking company will put one of its own investigators at the accident site - while the victim is still in the hospital, before any legal action has even begun. They're already at work, to prevent you from recovering a dime if their employee was negligent. Upsetting to know, isn't it? Whatever you do, do NOT hire an injury lawyer who has not successfully represented many victims of car-truck accidents. This type of litigation is very complex, and requires years of proven results to be successful. Don't risk it. If you are in an accident of any kind with a truck, it's obvious that the most immediate goal should be to obtain prompt medical attention. Obviously, that goes without saying. For tips on what you should do in this regard, take a look at our car accidents page. Aside from medical attention, it is extremely important that you take immediate steps to preserve or safeguard as much evidence as possible, in order to enable your attorney to undertake an immediate investigation of the vehicles. 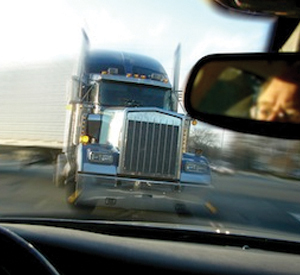 This step is very often a crucial step in winning a personal injury case that revolves around a trucking accident. Timing can be everything in these cases, and examination of the accident scene while the evidence is still recent, such as skid marks or damage to asphalt roadway, can be critical. Due to how aggressive trucking companies can be with these cases, it can often be necessary to obtain a court order preserving evidence, such as parts of the truck and/or car, so that they won't be 'lost' or destroyed. Driver log records may produce evidence of important maintenance and repairs done on the truck, and they should also provide the driver's work schedule. This can be important because some trucking company drivers will violate federal regulations that limit their time behind the wheel or on the job. And it will come as no surprise that there are trucking employers out there who encourage this misconduct. It's called "looking the other way." Equally important in the immediate aftermath of a truck accident is securing the names and contact information of as many witnesses as possible, at the accident scene if at all possible. Any witnesses need to be spoken to very quickly, or they, like we all do, will likely forget the details of what happened. However, unless it is felt by either you or someone who is with you at the accident scene, you yourself should normally not contact witnesses after the accident. You may say something to scare that person off. Leave those questions to your attorney. So that this can be done as productively as possible, contact us right after the accident to schedule a free initial consultation, and we can guide you through these first, and important, preliminary steps. Call us at Ph. : (781) 320-0062, or at Ph. : (617) 285-3600; or click here to send us a confidential email. We promise to get right back to you. After a truck accident, prompt contact must be initiated with state and/or federal investigating authorities, who often will do their own accident reconstructions. Aside from State Police accident reconstruction reports, and depending on what those reports say, your lawyer may very likely order an independent accident reconstruction specialist to prepare his or her own analysis and report. To help victims of truck accidents, we have prepared a FREE Injury and Accident Tip Sheet entitled "The Top 10 Tips If You Suffer A Personal Injury In Massachusetts." It will outline the right steps you need to take if you have been injured in a car-truck accident in Massachusetts, and are unsure of what steps to take. We are confident you will find this article extremely helpful. Click here, or click on the display button in the left margin of this page, to download this FREE and HELPFUL document. All of the above issues and more make it extremely important that if you have been injured in a Massachusetts truck-car accident, you should immediately retain an experienced Massachusetts car-truck accident lawyer to advise you, and if necessary, commence litigation to obtain financial damages for you. If you or someone you care about has been injured in a truck accident contact our office to schedule a free initial consultation. Call us at Ph. : (781) 320-0062, or at Ph. : (617) 285-3600; or click here to send us a confidential email. Who is Liable for My Injuries in a Truck Accident? Truck drivers can be held liable for personal injuries or wrongful death that are the result of their negligence. Very generally, negligence is the failure to use due care in a given situation - in this instance, in the operation of a truck. It is a legal principle that employers are (generally) vicariously liable for the negligence of their employees, and this applies to trucking company employers, also. If a trucking company hired an untrained or inexperienced driver, or if they knew or should have known that the driver was somehow no longer qualified to operate their truck, then they can be held directly liable. This can be true for both trucking employers, and lessees of trucks. Both of these categories can include supermarket chains, shipping companies, department stores, manufacturers, distributors and other businesses. In some cases, the truck's contents may have been loaded by a third party contractor. Negligent loading of a truck can cause heavy loads to either shift, causing the driver to lose control, or to fall off the truck. In that case, the third party can be held liable for negligence. Also, in some cases the truck might be defectively designed. In such a case, the manufacturer of the truck (or its trailer), or the manufacturer of the truck's component parts, might be liable for both negligence and for product liability. Lastly, truck accidents can also involve pedestrians and motorcycles. In each case, the insurance rules are different. In these types of collisions, the injuries are often catastrophic, disabling a person for life, or causing death. All of the above reasons make hiring an experienced Massachusetts truck accident lawyer a critical choice. At the Law Office of William D. Kickham and Associates, we have that experience. Our attorneys know how to deal with trucking companies and their insurers, to obtain the highest compensation possible for victims who are injured in trucking accidents. We manage these cases from initial investigation, through to trial, and, if necessary, appeal. Many people who are injured in a Massachusetts truck-car accident aren't sure if they should file a personal injury lawsuit because they assume - incorrectly - that their lawsuit will cost them thousands of dollars up-front in hourly legal fees. They're wrong. As with car accident cases or car-pedestrian accident cases, it is standard legal practice in truck-car accident cases that there are no legal fees paid up-front to the law firm that represents you. These types of cases are billed on a contingent-fee basis. This means that the law firm representing you is not paid any professional legal fees unless the firm successfully recovers financial damages for you at the end of the case, through either a jury verdict following a trial, or in a settlement in lieu of a trial. Assuming the firm recovers financial damages for you, the law firm takes a percentage of the financial recovery - commonly, 1/3 or 33.3% of the gross (total) amount paid on your behalf. If no financial damages are obtained for you by the firm, then you owe no legal fees to the law firm. Any expenses incurred by the law firm to litigate the case on your behalf are usually advanced on your behalf by the firm, and, often times, reimbursed at the end of the case by the client. As experienced Massachusetts truck-car accident attorneys, we help people throughout Massachusetts who have suffered serious injuries when their car was hit by a truck. Don't go up against a big truck company - or their insurance company - with an inexperienced attorney. If you or someone you care about has been injured in a car-truck accident, we have the knowledge and experience to make sure that you are compensated for your pain and suffering, physical and emotional injuries, and even for your lost wages. If you've been injured in this type of accident due to the negligence of the truck involved, you deserve to be compensated for your injuries. It's true that some truck-car accidents are simply accidents, where neither driver is at fault. That's rare, but it can happen. Sometimes, the truck driver's negligence is to blame for the accident and the resulting injuries. Truck drivers can be held liable for wrongful death or personal injury that is caused by their negligence -- which is failure to utilize reasonable care in the operation of their trucks. Truck company employers can be vicariously liable and responsible for the negligence caused by their employee drivers. Employers may be directly liable if they hired an incompetent or untrained driver, or if they employed the driver, knowing (or having reason to know) that he was no longer properly qualified when he was driving the truck. If you or someone you know has been injured as the result of a Massachusetts truck-car accident or has suffered a personal injury as the result of a truck driver's negligence, you are going to need to retain a talented and experienced Massachusetts truck-car accident lawyer - one who has a proven track record of success in winning these kinds of cases in Massachusetts. To hire a lawyer who handles these complex cases only "now and again" would be a foolish decision. In the legal profession, as in any profession, "experience and expertise" mean everything. Don't make a mistake now that could cost you a lot later. We know how to try and how to win these cases, and our talent is among the best in Massachusetts. Call us 24 hours a day, seven days a week at Ph. : (781) 320-0062 or Ph. : (617) 285-3600, or email us here online for a free initial consultation, and we'd be glad to let you know what your legal options are, and what we can do for you. Westwood and Boston, Massachusetts truck accident lawyer lawyer William D. Kickham has appeared as a legal analyst on a variety of respected media, including Court TV (now In Session on HLN,) Fox News TV-25/Boston, The Boston Herald, WBZ-AM Radio 1030, WCVB-TV5/Boston, Nightside With Dan Rea, Greater Boston With Emily Rooney, Money Matters Radio/Boston, and The Metro Newspaper/ Boston. Attorney William D. Kickham is turned to by respected reporters and media organizations in Massachusetts as an authoritative expert in the field of Massachusetts personal injury law, and the case results that he produces for his clients attest to this. Call us today at office number (781) 320-0062, or Atty. Kickham's cell phone number at (617) 285-3600, to arrange for a free initial consultation of your case. If the matter is not an emergency, you can email us here and we will respond to you very promptly.